(Trent Nelson | The Salt Lake Tribune) Utah Jazz forward Derrick Favors (15). Utah Jazz v San Antonio Spurs, NBA basketball in Salt Lake City on Tuesday Dec. 4, 2018. 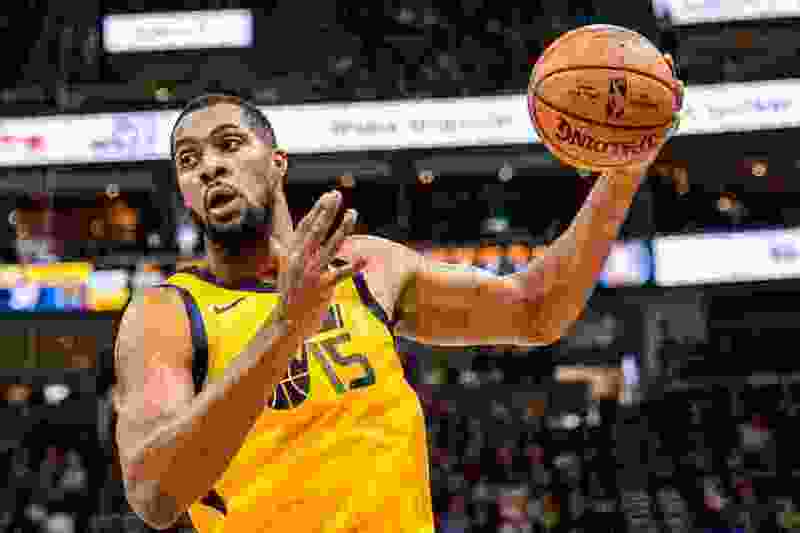 When Derrick Favors was brought back this past summer on a two-year deal, many critical fans wondered what exactly the Jazz were doing. These days, it’s safe to assume most of those same people now wonder what exactly the Jazz would do without him. His raw numbers don’t jump off the page at you — he’s averaging 11.7 points, 7.4 rebounds, and 1.5 blocks this season — but he’s certainly doing his part to remind anyone who may have forgotten just what kind of impact he can have on a game. Favors has certainly turned it on of late. In the Jazz’s past 10 games, the ninth-year big man out of Georgia Tech has averaged 14.8 points, 9.0 rebounds, and 1.9 blocks, while shooting 58.8 percent from the field. And those numbers are even dragged down a bit by two games (vs. OKC and Memphis) in which he totaled only a combined eight points and 11 rebounds on 3-for-10 shooting. He’s also had five double-doubles in that stretch. And he definitely is doing that. Honestly, his teammates and coaches say, it’s not that he’s doing anything drastically different these days, but simply that he’s finally healthy again. Indeed, it was the injury-plagued 2015-16 and 2016-17 seasons, in which he played 62 and 50 games, respectively, that led many to assume he was irrevocably broken and beyond redemption. This offseason, though, he was “working out two, three times a day,” getting his knees and legs and back and core strong. In fact, he’s having success in a lot of areas on the court. While his lack of 3-point shooting (he’s making just 22.4 percent from deep this season) have led many to conclude that that he’s an untenable anachronism in the frontcourt next to Rudy Gobert in this modern pace-and-space style of play, he’s finding plenty of other places in which to contribute. His lunchpail mentality was highlighted at the end of the third quarter Saturday night, when several Jazz misses became extra possessions simply by virtue of Favors outworking his Brooklyn counterparts and keeping the ball alive. Ingles, meanwhile, asked why his pick-and-roll sets with Favors have produced such good results of late, jokingly responded, “Fav is finally finishing at the rim!” before turning more serious. Anything more than a cursory look into his numbers bears that out — his per-36s indicate this is actually one of Favors’ best statistical seasons, as they extrapolate out to 17.9 points (third-best of his career), 11.4 rebounds (best), and 2.2 blocks (second-best). Favors’ 57.6 FG percentage is also a career-high. He also has proven to be one of the best rim protectors in the league this season, as shots within five feet are going in just 48.7 percent of the time against him. It’s not the stats, though, that tell the true story of Favors’ influence on the the Jazz, Snyder said — it’s the effort and the example. At Capital One Arena, Washington D.C.
About the Jazz • Utah begins its four-game road trip having won three straight overall. … Eleven of the Jazz’s 13 remaining games this regular season come against teams that are below .500, including all four on this trip. … Utah and Washington have yet to play this season, but will meet twice in a span of 11 days. About the Wizards • Washington is 6-4 in its last 10 games, and is coming off a 135-128 win over Memphis on Saturday. … All-Star guard Bradley Beal is averaging 26.2 points and 5.6 assists per game, while shooting 47.8 percent from the field. … In 16 games with the Wizards, forward Jabari Parker is averaging 14.5 points and 7.4 rebounds, while shooting 55.6 percent.